Sweet Romance Reads: What's Safe to Eat? The more I look into what to eat to stay healthy, the more confused I become. I've almost come to the conclusion all food and drink is bad for us. Take for instance, gluten something that has changed our wheat products. Many people (perhaps all of us) shouldn't eat anything with wheat (gluten) in it. That's a lot of food. Then there is sugar. There seems to be a rise in diabetes. We love sugar and sweet food, but we are being told to avoid sugar (even artificial sweeteners like stevia). As you can see below the dilemma on what to eat is driving me crazy. At one time eggs were bad for us, but now they are saying they are beneficial. How about chocolate? Dark chocolate can be beneficial. This list could go on and one. This isn't even with us considering how food is grown. Pesticides can be poisonous to us. Growth hormones fed to animals can be bad too. I'm honestly not sure what to eat or drink anymore. I want to eat the right foods, avoid what is bad for me, but what are they? How can we wade through all the studies done to figure how what to eat or not? Any suggestions? 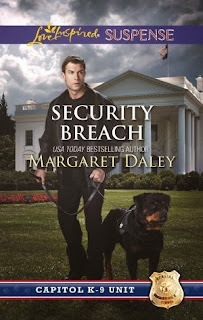 Margaret Daley, a USA Today’s Bestselling author of over ninety books (five million sold worldwide), has been married for over forty years and is a firm believer in romance and love. When she isn’t traveling, she’s writing love stories, often with a suspense thread and corralling her three cats that think they rule her household. To find out more about Margaret visit her website at http://www.margaretdaley.com. In June she has a new book out called Security Breach, Love Inspired Suspense. Blurb: When White House tour director Selena Barrow is attacked in her office, the Capitol K-9 Unit goes on high alert. Selena's cousin is a person of interest in a congressman's shooting, and Selena has been collecting evidence to exonerate her. Could this be the break they're looking for? Officer Nicholas Cole and his dog, Max, step in to safeguard Selena—and to keep an eye on the evidence. As the attacks escalate, Selena finds it increasingly difficult to keep her distance from her handsome protector. But with an unknown enemy watching Selena's every move, Nicholas will become her confidant…and her lifeline. Capitol K-9 Unit: These lawmen solve the toughest cases with the help of their brave canine partners. Have you signed up for Sweet Romance Reads newsletter yet? Each issue features sweet romance flash fiction and delightful stories that will warm your heart. It also included giveaways from our authors and news about their latest releases. Don't miss another issue. Scroll down the right side of our blog and enter your email address under Mailing List. I'm coming to that decision too, Lois. LOL! Such a great post, Margaret! You're so right. What's "bad" today seems to be "good" tomorrow and vice versa. Not long ago we were all encouraged to eat lots of gluten (whole wheat and multi-grains). Now it appears to be harmful to many people. Honestly, I give up too! I say the closer a food is to its basic form, like fresh fruits and veggies-- and the less processed something is -- it's likely to be better for you. Other than that, I just don't know. Margaret, I hear you. I think there are too many studies that contradict each other. I think we should go back to the 4 basic food groups, dairy, meat & protein, bread, and vegetables & fruit. Have something from each group at every meal. I think Americans are getting fatter because we eat out more. I know we do compared to when I was a kid, and we spend a lot of time in front of devices--computers, phones and TV. I've been battling a few extra pounds for the last 10 years. I gain a few, lose a few and start all over again. I was just having this conversation with my husband. We have no idea what to eat. Some people eat "healthy" and die relatively young, others eat unhealthy for most of their lives and live to be in their 90's. I've come to the conclusion that we should eat whatever we want in moderation, and remember to include fruits and vegetables daily. Food, Cowboys, and Romance...Oh, My!